The fight against the Keystone XL pipeline was just the beginning of the battle to stop climate change. Something similar is happening right now with the fossil-fuel industry. Even as the global warming crisis makes it clear that coal, natural gas, and oil are yesterday’s energy, the momentum of two centuries of fossil-fuel development means new projects keep emerging in a zombie-like fashion. In fact, the climactic fight at the end of the fossil-fuel era is already underway, even if it’s happening almost in secret. That’s because so much of the action isn’t taking place in big, headline-grabbing climate change settings like the recent conference of 195 nations in Paris; it’s taking place in hearing rooms and farmers’ fields across this continent (and other continents, too). Local activists are making desperate stands to stop new fossil-fuel projects, while the giant energy companies are making equally desperate attempts to build while they still can. Though such conflicts and protests are mostly too small and local to attract national media attention, the outcome of these thousands of fights will do much to determine whether we emerge from this century with a habitable planet. In fact, far more than any set of paper promises by politicians, they really are the battle for the future. I hesitate to even start listing them all, because I’m going to miss dozens, but here are some of the prospective pipelines people are currently fighting across North America: the Alberta Clipper and the Sandpiper pipelines in the upper Midwest, Enbridge Line 3, the Dakota Access, the Line 9 and Energy East pipelines in Ontario and environs, the Northern Gateway and Kinder Morgan pipelines in British Columbia, the Piñon pipeline in Navajo Country, the Sabal Trail pipeline in Alabama and Georgia, the Appalachian Connector, the Vermont Gas pipeline down the western side of my own state, the Algonquin pipeline, the Constitution pipeline, the Spectra pipeline, and on and on. And it’s not just pipelines, not by a long shot. I couldn’t begin to start tallying up the number of proposed liquid natural gas terminals, prospective coal export facilities and new oil ports, fracking wells, and mountaintop removal coal sites where people are already waging serious trench warfare. As I write these words, brave activists are on trial for trying to block oil trains in the Pacific Northwest. 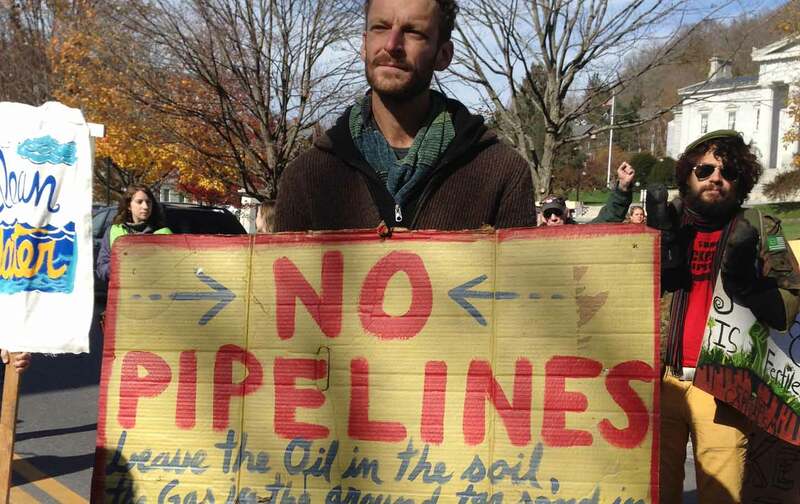 In the Finger Lakes not a week goes by without mass arrests of local activists attempting to stop the building of a giant underground gas storage cavern. In California, it’s frack wells in Kern County. As I said: endless. And endlessly resourceful, too. Everywhere the opposition is forced by statute to make its stand not on climate change arguments, but on old grounds. This pipeline will hurt water quality. That coal port will increase local pollution. The dust that flies off those coal trains will cause asthma. All the arguments are perfectly correct and accurate and by themselves enough to justify stopping many of these plans, but a far more important argument always lurks in the background: each of these new infrastructure projects is a way to extend the life of the fossil-fuel era a few more disastrous decades. Here’s the basic math: if you build a pipeline in 2016, the investment will be amortized for 40 years or more. It is designed to last—to carry coal slurry or gas or oil—well into the second half of the twenty-first century. It is, in other words, designed to do the very thing scientists insist we simply can’t keep doing, and do it long past the point when physics swears we must stop. These projects are the result of several kinds of momentum. Because fossil-fuel companies have made huge sums of money for so long, they have the political clout to keep politicians saying yes. Just a week after the Paris accords were signed, for instance, the well-paid American employees of those companies, otherwise known as senators and representatives, overturned a 40-year-old ban on US oil exports, a gift that an ExxonMobil spokesman had asked for in the most explicit terms only a few weeks earlier. “The sooner this happens, the better for us,” he’d told The New York Times, at the very moment when other journalists were breaking the story of that company’s epic three-decade legacy of deceit, its attempt to suppress public knowledge of a globally warming planet that Exxon officials knew they were helping to create. That scandal didn’t matter. The habit of giving in to Big Oil was just too strong. The money, however, is only part of it. There’s also a sense in which the whole process is simply on autopilot. For many decades the economic health of the nation and access to fossil fuels were more or less synonymous. So it’s no wonder that the laws, statutes, and regulations favor business-as-usual. The advent of the environmental movement in the 1970s and 1980s introduced a few new rules, but they were only designed to keep that business-as-usual from going disastrously, visibly wrong. You could drill and mine and pump, but you were supposed to prevent the really obvious pollution. No Deepwater Horizons. And so fossil-fuel projects still get approved almost automatically, because there’s no legal reason not to do so. This zombie-like process is guaranteed to go on for years, even decades, as at every turn the fossil-fuel industry fights the new laws and regulations that would be necessary, were agreements like the Paris accord to have any real teeth. The only way to short-circuit this process is to fight like hell, raising the political and economic price of new infrastructure to the point where politicians begin to balk. That’s what happened with Keystone—when enough voices were raised, the powers-that-be finally decided it wasn’t worth it. And it’s happening elsewhere, too. Other Canadian tar sands pipelines have also been blocked. Coal ports planned for the West Coast haven’t been built. That Australian coal mine may have official approval, but almost every big bank in the world has balked at providing it the billions it would require. And in a few places you can see more than just the opposition; you can see the next steps unfolding. Last fall, for instance, Portland, Oregon—the scene of a memorable “kayaktivist” blockade to keep Shell’s Arctic drilling rigs bottled up in port—passed a remarkable resolution. No new fossil-fuel infrastructure would be built in the city, its council and mayor declared. The law will almost certainly block a huge proposed propane export terminal, but far more important, it opens much wider the door to the future. If you can’t do fossil fuel, after all, you have to do something else—sun, wind, conservation. This has to be our response to the living-dead future that the fossil-fuel industry and its allied politicians imagine for our beleaguered world: no new fossil-fuel infrastructure. None. The climate math is just too obvious.